For about 15 years now I've wanted to do something with stick figures. I never knew what. I just wanted to try animating them. The games I like tend to be isometric or top-down views; I generally don't like first person or side views. As a result, stick figure animation just never seemed useful enough to put into one of my games. While reading Scott McCloud's books about comics a few years ago, I had an idea blending comic books and games, and it just happens to be a good fit for stick figure animation. I'm not sure I want to pursue it, but since I had spent so much time on the spaceship physics and editor, I thought it'd be a good break for me to take a break and take a look at stick figure animation. If it turns out to be fun I might explore the comic book idea a bit more. The other thing that I've been wanting to explore is the ninja side of the pirates vs. ninjas theme. Sure, we have Ask a Ninja, but overall I think the pirates have gotten far too much attention. There are several pirate-themed games, like Sid Meier's Pirates, Puzzle Pirates, and Tropico 2 Pirate Cove, but not so many for ninjas. Talk Like a Pirate Day gets plenty of attention but the equivalent for ninjas just doesn't compare. Only the Somali pirate attacks are hurting the pirate image. So if I write a stick figure animation game, the protagonist will be a ninja fighting the evil pirates. How am I going to make my 2D ninja stick figure move? There are are lots of approaches to character animation: forward kinematics, inverse kinematics, physical simulation, “ragdoll” physics, motion capture, etc. My goal was to make something simple and reasonable without putting in much artwork (motion capture or hand-drawn animation). 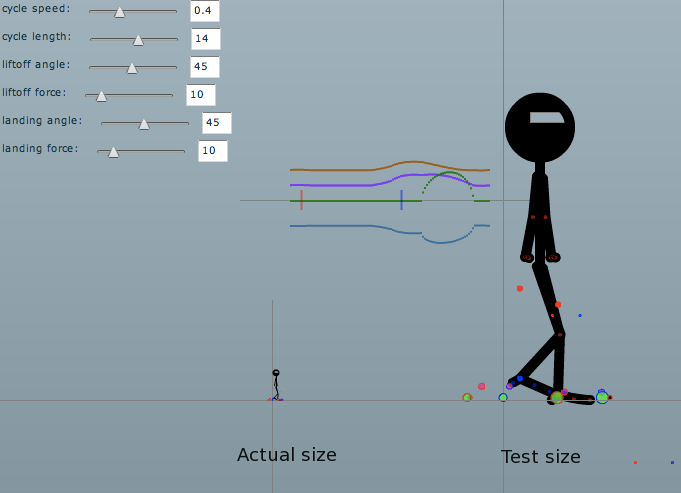 My hope was that a 2D stick figure would take much less effort than the full 3D motion systems. I wanted to try the simplest approach first, using basic geometry to move the legs. The hip and knee angles tell me where the ankle will end up. If I know where I want the ankle to be, I should be able to find the hip and knee angles. I tried approaching it as a gradient function, using hill-climbing to reach the solution, but it turns out this is overkill if you only have two angles. The femur and tibia length are known, and I know the distance between the hip and my desired ankle position. That means we know the three sides of the triangle, and can use the law of cosines to determine the angles. Simple. Ankles and wrists work out pretty nicely. The next step was to make the figure take a step (pun intended, sorry!). I looked at some animator pages about the walk cycle I also read lots of papers about walking mechanics, including some about automatically “learning” how to walk. Along the way I discovered something cool: passive walking dynamics (see animation here), which treats walking as an inverted pendulum (your body over the supporting leg) and a normal pendulum (your free leg swinging freely). It seems to be a pretty good approximation of how people walk. I decided the simplest thing would be to make the target ankle position follow a circle, as if you were on a bicycle, and then have the ground prevent your foot from going down. This actually looked reasonable, but the “liftoff” and “landing” of the foot didn't look right. To make them look better, I added transitions (see this page) that used the toe as a pivot point (for liftoff) and the heel as a pivot point (for landing). This definitely looked better, but the liftoff and landing have the ankle moving in circular arcs, and these don't smoothly transition into the overall circular motion. I improved it a bit more by making the ankle follow a spline that matched the arcs. I'm not sure where I want to go with this. The walking research papers were cool, but I didn't find research papers about gravity-defying ninja backflips. My gut tells me that the ninja doesn't obey the laws of physics, and thus I should stick to the geometrical approach instead of using a physics engine. Box2D looks pretty neat, and I'm sure I can use physics for other things in the game. But I need to first figure out how I'm going to implement ninja moves. Do I want to procedurally generate them somehow, or do I want to hand-pick the key frames? It'd be cool to generate them in a way that could take into account everything in the scene. For example, a jump kick should be able to jump on the box before jumping for the kick. But I suspect that's a lot more work than I want to tackle right now, and unless it's a key part of the game (if I end up writing a game), it's just not that important. That brings up the question: what is the goal here? Am I doing this to satisfy my long-time dream of animating stick figures, or should I try to write a little game that can show off the comic book idea, or do I really want to write a game? I don't know yet. So that leaves me at: I still want to do something with animated stick figures, and I still don't know what. But if I ever figure it out, I have now learned some things that might come in handy.